Orange buttercup squash is small to medium in size with a squat, round shape, flattened bottom, and thick, rough, light brown stem. The skin can be smooth or slightly warty and is a vibrant orange with faint yellow vertical striping and a dark green starburst or ring around the stem end. Buttercup squashes are also known for their characteristic turban-like caps located on the blossom end. These caps will vary in size depending on variety and increase in size as the squash matures. Its thick orange-yellow flesh is dense with a hollow central cavity filled with stringy pulp and many flat, cream-colored, hard seeds. Known for its satin-like texture and mild flavor when cooked, Orange buttercup squashes are sweet and rich, similar to that of sweet potato. Orange buttercup squash has limited availability in the fall through winter. 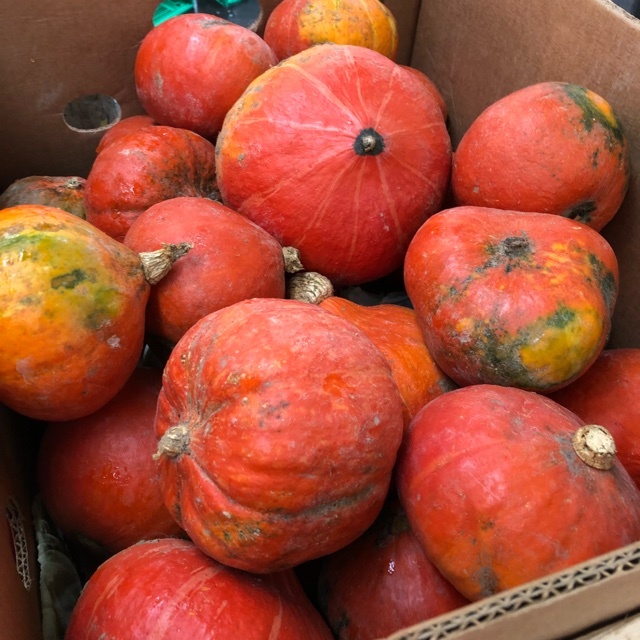 Orange buttercup squash, botanically classified as Cucurbita maxima, is a rare winter squash variety that grows on a vining plant and is a member of the Cucurbitaceae family along with gourds and pumpkins. Orange buttercup squash was created from the popular green buttercup in an effort to create a squash with improved flavor and texture, and there are several different varieties including greengold and kindred. Though difficult to find in the market, Orange buttercup squash is one the earliest ripening winter squashes and is highly versatile in culinary applications. It is known for its sweet flavor, creamy texture, and is sized appropriately for a healthy, two-person serving. Orange buttercup squash is an excellent source of dietary fiber, vitamins A and C, beta-carotene and calcium. Orange buttercup squash is best suited for cooked applications such as baking, steaming, or roasting. It can be used to create sweet or savory fillings, stuffed as a main dish, used in baking, pureed and added to soups, curries, and risotto, or combined with cheese and herbs for fresh pasta or ravioli stuffing. The squash’s smooth, fiber-less texture also lends itself to making sauces, squash butter, and spreads. Orange buttercup squash pairs well with apple, pear, lime, leeks, kale, spinach, maple syrup, brown sugar, chili, curry, beef, poultry, chorizo, sausage, butter, Parmigiano-Reggiano, and fresh herbs such as sage, thyme, and cilantro. It will keep 1-2 months when stored in a cool and dry place. 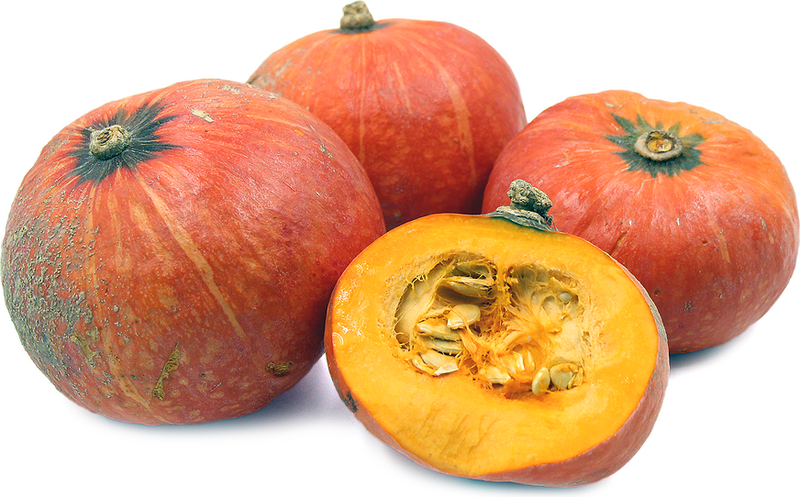 Orange buttercup squash is a rare variety that is difficult to find in the marketplace. It is most commonly found on online seed catalogs for home gardens as it can be grown in a compact space such as a container. Orange buttercup squash is also a favorite of cold climate gardeners, especially in Alaska, because it is one of the few varieties that will ripen in Alaska’s short growing season. Buttercup squash was first discovered by Dr. Albert F. Yeager at the North Dakota State University Agricultural Experiment Station in 1925. This chance seedling was originally believed to be a cross between a quality and essex squash, and the seeds were saved, replanted, and put through years of selection and self-pollination until the squash was released in 1931 under the buttercup name. After the release of the green buttercup squash in 1931, much experimentation was done by those working in agriculture research and development to attempt and create different varieties of this superior flavored squash. One of the first Orange buttercup varieties known as the greengold was created from an inbred selection of green buttercup at the Minnesota Agricultural Experiment Station in 1939. Today Orange buttercup squash is available in limited supply at specialty grocers and farmers markets in the United States. Recipes that include Orange Buttercup Squash. One is easiest, three is harder. People have shared Orange Buttercup Squash using the Specialty Produce app for iPhone and Android. Sharer's comments : Orange Buttercup Squash spotted at Marche Raspail Paris . Sharer's comments : Orange Buttercup Squash spotted at Taft Farm.